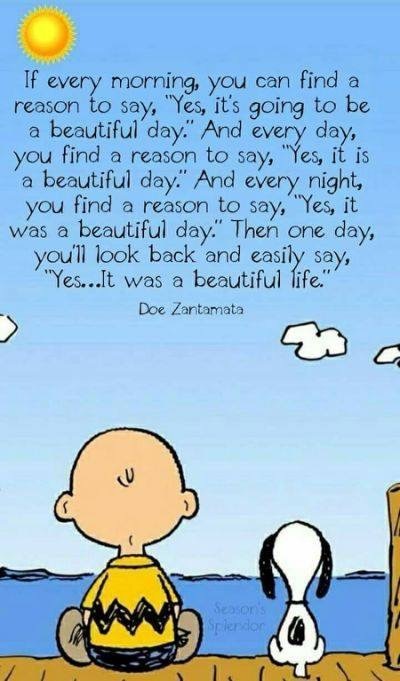 This entry was posted in Giving thanks, Inspiration, joy, Quotes, wonder and tagged Attitude, Beautiful life, Charlie Brown, Quotations, Snoopy. Bookmark the permalink. So true. One step at a time. Have a beautiful day, weekend, week, month and life. Sometimes it just takes one thought. Best to you, Pete. I believe we can always change our thought processes to appreciate and give thanks for each day. I think about the alternative as a woman who has lived many years, and every minute feels like a miracle. What we tell ourselves, we can make real. Well said, Anne. I applaud you! Thank you kindly, Jennie. I think I caught it from you!!! A thought to remember, Jennie. Sending you all the best. Love this, and it’s a great reminder! Jennie, thank you so much for this lovely thought! I’m glad you liked it, Charles. Here is a wonderful post from the excellent writer, Jennie! To open your eyes into a universe of such immense wonder has got to be beautiful hasn’t it? I know! Thank you, Jill. Yes, it’s that easy! Thanks for the reminder not to make life more complicated than it needs to be, Jennie. I agree. Everyday is beautiful no matter what.